I read the message on this vintage postcard, and instantly came to only one conclusion. The sender was waiting on an answer from Miss Maud to his marriage proposal! He even had plans to ask the question again. How romantic. Even my daughter agreed this message was romantic. The more I thought about it though, the more I doubted my hasty conclusion. Why would a beau, with life-long love in mind, use a postcard to inform his potential future bride that he’s waiting for an answer? Another thought occured to me. Maybe the sender asked Miss Maud to accompany him or her on a trip. I wonder where to. The State Automobile Road was built in 1912, which connected Lewiston, Maine to Portland, Maine. 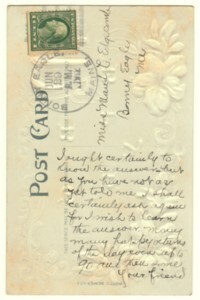 The postcard has a 1912 Bonny Eagle, Maine postmark. This opened up the possibilities of where they could be planning to go. It is signed “your friend”, so this conclusion is more likely. Either way, this makes for an interesting message as there are endless possibilities of what answer the sender is seeking. What answer do you think the sender was seeking? ** If you like this post, click on the bookmark button to the right to share it. You’re welcome. The back’s of postcards can be so funny or intriguing; especially when you add speculation on what they could’ve meant.